connect with the Key System. The Key System, formed in 1903, was a network of commuter rail and bus lines connecting cities and neighborhoods in the East Bay to San Francisco by way of the Mole.After completion of the Bay Bridge, use of the Mole declined but continued until about 1957. It was demolished in the mid-1960s to allow for an expansion of the Port of Oakland cargo facilities. The pier began as a smaller landing called Gibbon's Wharf extending from Gibbons Point, later re-named Oakland Point, westward into San Francisco Bay. In 1868, the Central Pacific Railroad acquired this pier and immediately began extending and improving it and renamed it the Oakland Long Wharf. This wharf was used by the CPRR for transporting freight cars over to San Francisco starting in 1871. Part of the wharf was filled in between 1879 and 1882, thus creating a mole. Local commuter trains also used the pier, while the first transcontinental railroad trains used another wharf in nearby Alameda for about two months in 1869 (September 6 - November 7). On November 8, 1869, the Oakland Long Wharf became the western terminus of the first transcontinental railroad. Thereafter, ferries carrying both commuters and long distance travelers operated between the Long Wharf and San Francisco. After the Central Pacific's operations were consolidated under the Southern Pacific in the 1880s, the Long Wharf was improved and the terminal buildings at the end of the pier rebuilt.Beginning on January 15, 1939, electric commuter trains no longer ran to the Long Wharf (by then known as the SP Mole or, officially by the Southern Pacific, as Oakland Pier). Instead, they operated over the San Francisco-Oakland Bay Bridge to the Transbay Terminal in San Francisco. 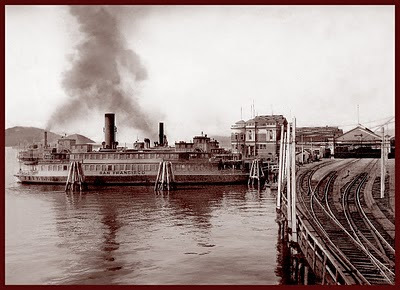 However, regular passenger trains continued to run to Oakland Pier until 1958, when the last Southern Pacific ferryboat service from the Ferry Building in San Francisco to Oakland Pier was discontinued. After that, service to San Francisco was by bus over the Bay Bridge from Oakland's 16th Street Station. Throughout the pier's existence, progressively greater portions of the bayshore tidelands were filled in. It was demolished in the 1960s to make way for an expansion of the burgeoning Port of Oakland's container ship facilities. Today, the only thing that remains of the SP Mole is the pier's switchman's tower which was restored as part of Middle Harbor Shoreline Park. The mole in its latter years can be seen at the beginning of the 1957 movie Pal Joey as Frank Sinatra's character makes his way to the ferry.